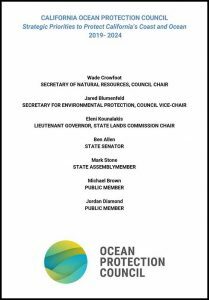 The Ocean Protection Council (OPC) is pleased to announce the release of the Proposition 68 (Prop 68) Draft Grant Guidelines. Funds from Prop 68 will be used to support the priorities of all of the OPC’s program areas for the next several years. 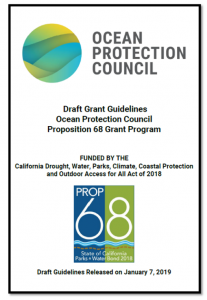 The Draft Grant Guidelines provide an overview of the purpose of Prop 68 funds, which projects and applicants will be eligible to receive funds, the OPC’s competitive and discretionary grant programs, proposed scoring criteria to assess projects, and requirements for future grantees. The comment period closed on February 28, 2019. OPC staff is now reviewing comments and revising the guidelines, and anticipates releasing the revised guidelines in late April or early May 2019. The most up-to-date information on the Prop 68 Grant Guidelines, including webinar slides, is available on the Prop 68 webpage. Questions about the Prop 68 Grant Guidelines may be submitted to Prop68@resources.ca.gov. The research projects were selected through a competitive process based on criteria developed by OPC in alignment with its mission and priorities. California Sea Grant and the University of Southern California Sea Grant facilitated the review panel process and will administer project grants on behalf of OPC. California Sea Grant is administering 12 of the 24 projects in the areas of ocean acidification and hypoxia, and sustainable fisheries and aquaculture. University of Southern California Sea Grant is administering the remaining 12 projects in the areas of sea-level rise adaptation and coastal resilience, coastal sediment management, marine pollution, and marine renewable energy. Details and links to project descriptions can be viewed HERE.